Essentials of SLA for L2 Teachers: A Transdisciplinary Framework presents an accessible and comprehensive account of current understandings of second language acquisition (SLA) geared towards those studying to become L2 teachers. Grounded in the pragmatic and problem-oriented transdisciplinary framework of SLA, this textbook draws connections between SLA research and practices for L2 teaching. 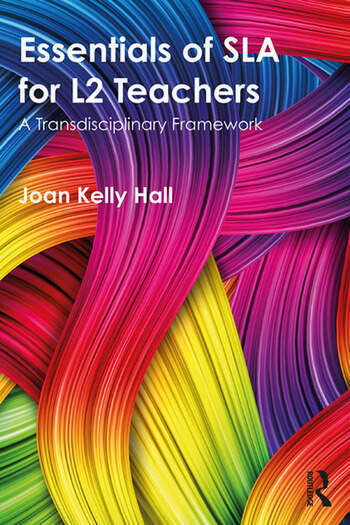 It aims to build L2 teacher expertise by strengthening teachers’ understandings of the many facets of L2 learning and their skills for designing transformative learning environments in their teaching contexts. The author includes pedagogical implications and inquiry-based activities in each chapter that engage readers in further explorations of the topics covered in the chapter. Short and straightforward, Essentials of SLA for L2 Teachers is the ideal main resource for SLA courses taught at undergraduate and graduate-level teaching programs. Joan Kelly Hall is Professor of Applied Linguistics and Director of the Center for Research on English Language Learning and Teaching at the Pennsylvania State University, USA. She is a member of the Douglas Fir Group who authored the 2016 paper in The Modern Language Journal proposing a transdisciplinary framework of SLA on which this text builds.